Guy Ritchie’s next “gangsta” movie arrives on Blu-ray which is thoroughly immersed in UK gangster lore and clichéd stereotypes. The film revolves around “One Two” (Gerard Butler), a small time crook who is given the opportunity of performing one last crime that will allow him and his family, the chance to retire. Thandie Newton plays One Two’s former flame who is now a successful accountant in the criminal world and her current client is a member of the Russian Mafia. She decides to recruit One Two and by informing him of where the money transaction will occur, his team of roughies will be able to take the cash like taking a lollypop from a baby. To compound the situation, the leader of the Russian Mafia has borrowed his “good luck” painting to another British Gangster (Tom Wilkinson) as a gesture of good faith and to hopefully improve his luck. Unfortunately for him, this painting is stolen by a former Rock ‘n Roll star who has faked his death and is now heavily into drugs. There are various plots happening all at once which is a trade mark of Ritchie such as the two music agents played by Jeremy Piven and Ludacris who are attempting to find their former Rock and Roll star as they have been threatened with violence if they cannot find in. 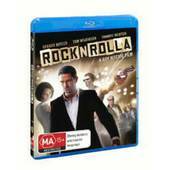 Unfortunately for all involved, this “RocknRolla” causes all three worlds to collide in this classic Guy Ritchie gangster movie that involves brilliant dialogue, an entertaining and catchy story and some great acting performances by all involved, especially Butler, Newton and Wilkinson. With exceptional video and audio quality, especially the thumping soundtrack thanks to the various bands that star on the soundtrack such as The Clash, RockNRolla is a great social commentary and pop culture film about the British criminal underworld. Classic stuff!